It’s a new year, and #LCSM Chat is transitioning to monthly chats. 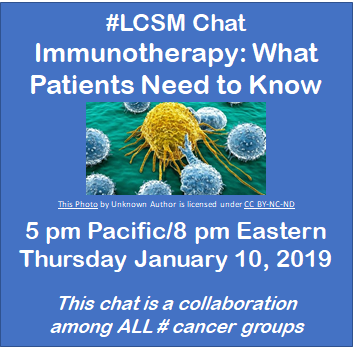 Our first chat is a collaborative chat across all cancer hashtag communities titled “Immunotherapy: What Patients Need to Know.” The discussion will cover all types of immunotherapy currently approved for treatment of any cancer. Chat moderator Janet Freeman-Daily (@JFreemanDaily) will be joined by special guest Lisa Rezende (@LisaRezende1), a biology educator (Assistant Professor of Practice) on the Molecular and Cellular Biology faculty at the University of Arizona. Lisa is also a long-term volunteer cancer advocate with FORCE (Facing Our Risk of Cancer Empowered), a cancer previvor (BRCA1 mutation carrier), daughter of a long-term ovarian cancer survivor, and recent caregiver to her stepmother through her diagnosis, treatment and hospice for Stage IV inflammatory breast cancer. T1: Why doesn’t the immune system prevent cancer? T2: What types of immunotherapy have been approved? T3: How can we tell if immunotherapy will work for my cancer? T4: What are the downsides of immunotherapy? T5: How can I find the right immunotherapy clinical trial for me? Hope you will join members of the #LCSM, #BCSM, #BTSM, #GYNCSM, #MMSM, #AYACSM, and other cancer hashtag communities for this tweetchat on January 10, 2019, at 5pm Pacific, 8 pm Eastern. Please remember to include #LCSM in ALL your tweets so the other chat participants can see them. If you need a refresher on how to participate, read our primer on participating in the chat . Note that some tweetchat apps (like tchat.io) will not display tweets longer than 140 characters. ← #LCSM Chat 11/29: What’s a cancer model, and why should I care?